January 29, 2019, had to have been one of the coldest days on record for a long time in many parts of the northern and midwestern parts of the country. In some places it got down to almost -30 with wind chills increasing many of those places down to -50, giving almost three-quarters of the U.S. population a bone-chilling cold. 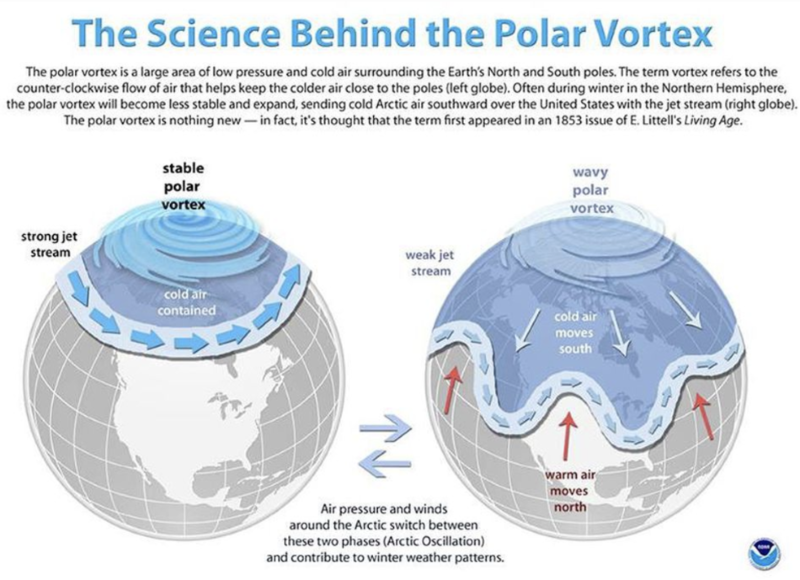 A Polar Vortex is a low-pressure area – essentially a wide expanse of swirling cold air – that is parked over polar regions, according to the National Oceanic and Atmospheric Administration. 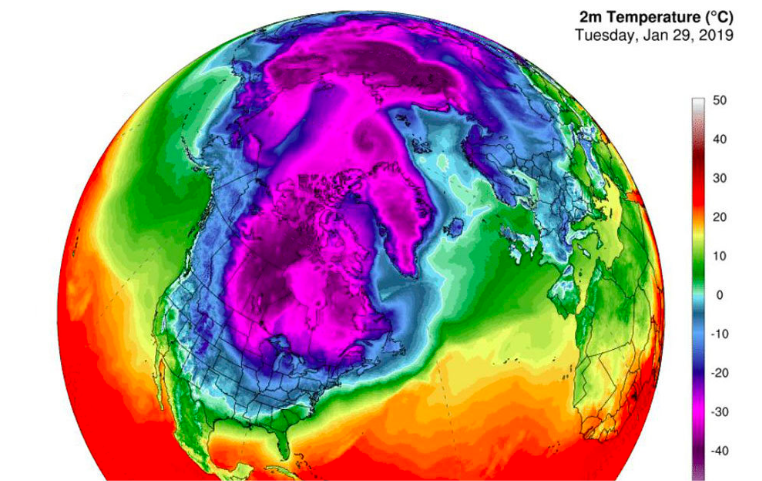 Some of those that deny climate change used the polar vortex to call into question the warming of the planet, but just because the cold is in one place, doesn't mean the planet isn't warming. The Arctic is warming two to three times as fast as the global average. in other words, even with the cold, global warming is still a major problem. In Australia, the temperature went above 40 degrees Celsius (104 degrees Fahrenheit), proving that the weather has been in the extreme on both ends within the past few weeks. Melting sea ice speeds up the warming in the Arctic opens up more water to absorb more heat, than before, because of the way sunlight reflects off of the Earth's surface. Changes are happing and not just ones that affect the Arctic, the planet is an interconnected system and the melting is already having an effect on the southern parts of the globe. The jet stream is another one of the key players in the weather patterns of the US and other areas around the world. Jet streams are relatively narrow bands of strong wind in the upper levels of the atmosphere. In this case, the polar jet stream is the one that caused the cold temperatures we saw on Jan. 30th is mainly driven by the temperature contrast between masses of icy air over the North Pole and warmer air near the equator. it is the strongest in the winter because of this, producing a stronger effect for those living in the Americas, Europe, and Asia. When it rolls along normally, the weather is relatively normal. But sometimes, when there is a slow down in how the jets stream moves it causes a big dip in the line and this dip (depending on the time of year) is why there is such a contrast in temperatures. the faster it moves the smaller it dips, the same goes for if it slows down. And its changing. Over the past several decades, weakening because of human-caused global warming. The last few years have been some of the warmest on record and it's only going up from there.